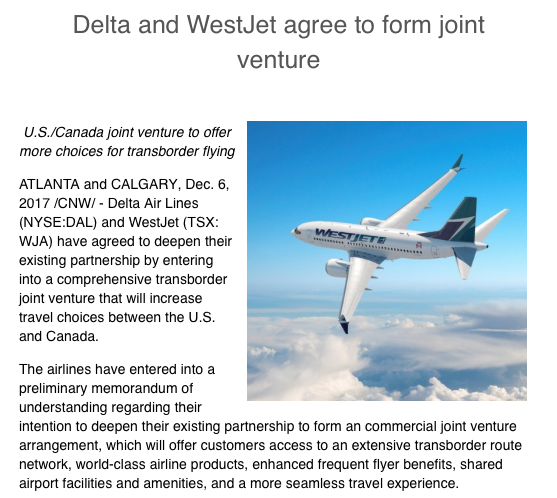 Rewards Canada: Delta and WestJet agree to form joint venture - to include reciprocal elite member benefits! Delta and WestJet agree to form joint venture - to include reciprocal elite member benefits! The latter one is awesome news! This is yet another step in the growth of WestJet Rewards and its evolution into a full fledged frequent flyer program. Right now WestJet Elite members have no benefits outside of WestJet but it appears that Gold (and perhaps Silver) members will soon get some benefits when flying on Delta! Seeing that reciprocal benefits for elite members is not subject to government approval we should see this happen regardless of whether the joint venture is approved or not.